The lava in one of the channels on Mount Mayon has advanced 300 meters since Friday according to the latest bulletin of the Philippine Institute of Volcanology and Seismology (Phivolcs) released on Sunday at 8 a.m. According to Phivolcs's latest 24-hour observation of Mayon's state of unrest, from four kilometers Friday, the lava has flowed to 4.3 kilometers on the Bonga-Buyuan Gully towards Legazpi City. The lava flow on the Miisi Gully towards Daraga town, on the other hand, has reached 3.2 kilometers. Mariton Bornas, chief of Phivolcs' Volcano Monitoring and Eruption Prediction division, said that it was still hard to tell if the lava would reach up to six kilometers just like it did in December 29, 2009. "It is hard to say because the lava could also split and branch out to other channels," Bornas told the Inquirer. Bornas also said that in their calculations, the average outflow of lava per day is at 2 million cubic meters. 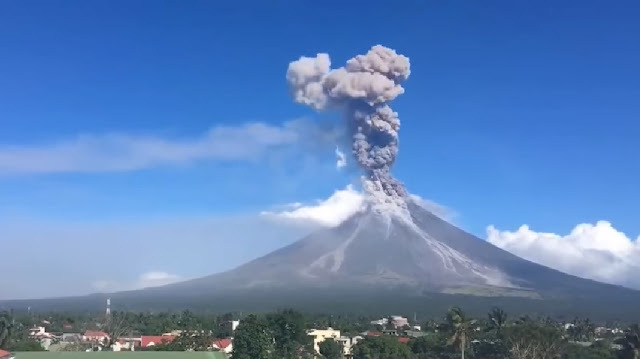 According to Phivolcs, during the last 24-hour monitoring of Mayon, the volcano emitted another ash column that reached 500 meters high and one weak lava fountaining event that lasted for a little more than half a minute. Also, 55 volcanic quakes and nine rockfall events were recorded. According to Cedric Daep, chief of Albay Public Safety and Emergency Management Office, the village center nearest to the gully is about seven to eight kilometers away. Alert Level 4 is still raised over Mayon and Phivolcs maintains that residents must stay away from the 8-kilometer danger zone.